Starring Mort Sahl, Sue Randall, Werner Klemperer. Written by Howard Rodman from a novel by Charlotte Armstrong. TV writer Sam Lynch (Sahl) overhears Mr. Clark and “Baby” Hoffman (Klemperer and Julian Burton) in a restaurant plotting to kidnap Kay Salisbury (Randall), a wealthy businessman’s daughter. When the two men discover Sam listening in, they follow him back to his apartment and give him a beating, promising that there’s more where that came from if he doesn’t keep his trap shut. Wanting to do the right thing, Sam goes to see Salisbury and meets with her father. The man dismisses him as a crackpot and, dejected, Sam leaves. On his way out, he bumps into Kay and rushes her into his car, effectively kidnapping her before she can be kidnapped. Never one to look a gift horse in the mouth, Mr. Clark calls Salisbury and demands the ransom. Salisbury agrees to pay the man $80,000. PE: I’m not sure comedian Mort Sahl was the right guy for the title nebbish. In 1960, he’d had very little acting experience. Not that this role was very demanding. He's called upon to either look dazed, scrunch up his face, or curl his lip. Sometimes all three at a time. Depending on the emotional need of the scene, he resembles either Frankie Valli, Casey Kasem or the big turkey monster from The Giant Claw. He’s not very convincing when he gets the drop on Mr. Clark and screams (in a nebbishy growl) “MOVE AND I’LL KILLYA!” I couldn’t get past wondering where Werner Klemperer was hiding his monocle. 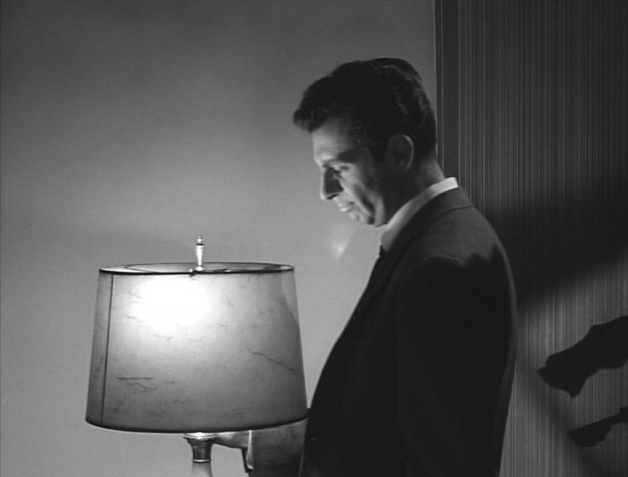 JS: Sahl was so bad in this role, he was outperformed when playing opposite a lamp. At least the lamp had range. Perhaps director Markle should have told him, "Get in the world, will ya!" Fortunately, there are a handful of high points in casting that almost make this episode watchable. It was nice to see Psycho alum Frank Albertson (I could almost imagine him being the same character dealing with a different spoiled daughter). And best of all, the well schooled among us got to exclaim "Good morning Miss Landers!" I expect that Peter is either too cool or too old to have watched enough episodes of Leave it to Beaver to appreciate it (too cool -PE), but tuning into an episode with Sue Randall as the Beav's teacher Miss Landers was almost as exciting as stumbling across a Batgirl (Yvonne Craig) episode of Batman. I don’t know about you, but I couldn’t remember all that if I was stone cold sober, let alone when I’m seeing pink elephants. The other occurs when Sam goes to a pawnbroker to get a gun (Sam must have called ahead because the gun comes up from the desk-Presto!). The shylock is seated behind a caged teller window. After completing their business, Sam asks to use the man’s phone and slides down to the end of the counter, where we can clearly see that the man is not behind a cage, simply a small window. Maybe it's me, but you don't accentuate your shortcomings (unless your William Shatner, but that's another day). PE: After such an upswing with “Knock Three-One-Two,” we’re back to badly written, unengaging tripe. JS: Comparatively speaking, the working over Sam gets in this episode is an embarrassment after the nifty fight scene from "Knock." On the bright side, now we know where Quentin Tarantino got his inspiration for the final shootout in Reservoir Dogs. This should have been called "Man in a Muddle" and is just about the worst episode so far on Thriller. Mort Sahl acts in a ridiculous and crazy fashion and the police should have arrested him for kidnapping! The last Fletcher Markle episode and this shows us what Thriller would have been like if he had continued as producer. If it was possible to give a minus Karloff, that's what this terrible segment would get from me. Thank god "The Cheaters" is next! Believe me Walker, I did give the damn thing a negative. I gave it -3 Karloffs but Scoleri gave it 4 Karloffs. By the rules we've set out for ourselves, we average our scores. Blame him!! I assume that this episode was Fletcher Markle's farewell gift to himself: a chance to produce AND direct. Too bad. I also assume that Mort Sahl was a pal of his or Hubbel Robinson's. Sure, Sahl was popular at the time, but....COME ON! What a schlep. What a schlub. I almost wish the "working over" scene in the hotel room had gone on longer. The show is dead-in-the-water from the very first shot. Everyone else, though, does their professional best to compensate for the dead-weight (aka: Mr. Sahl). I greatly enjoy anything that Frank Albertson appears in (old "Hee-haw" Sam Wainwright from "It's a Wonderful Life"). In his youth he was a charming light comedy guy, and here he does what he can with the role of the concerned dad. I also wondered why, with c. 15 actors listed in the closing credits, Peter Leeds did not receive a mention. He was the tall TV writer ("Larry") in Act 1. 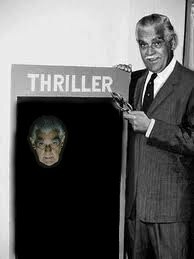 (Any Stan Freberg fans out there? Leeds voiced the wasted beatnik bongo player in Freberg's classic 1957 send-up of Harry Belafonte's "Banana Boat Song"). I digress here because these things are the only reason to EVER watch "Man in the Middle" again. And that annoying jazzy trumpet thing that went on throughout Rugolo's score almost made me (once again) kick in the TV screen. But.... "The Cheaters" is here, and we begin our long climb out of our self-imposed TV viewing Hades. I'm a bit behind and bringing up the rear here, but I love the Mystery Science Theater aspect of these commentaries. They are way more entertaining than some of these early episodes...including the dreadful Man in the Middle. I wasn't familiar with Mort Sahl before reading this post, and I couldn't help thinking of Kevin McDonald from Canadian comedy troupe The Kids In The Hall the whole time...in fact, at one point I was hoping Man in the Middle would turn into a Kids skit to keep me from drooling down my chin. Mort's beat down at the hand of balding bad guy's muscle was WEAK. Why would any blackmailer/kidnapper/murderer be talking so openly about a score/kidnapping/potential murder in a public place is a contrivance I simply can't get past...although Sahl's character addressing his future tormentors with loud-enough-to-be-overheard pseudo-philosophical bar talk was kind of cool. Larry, there is at least one more Stan Freberg fan reading this blog. Imagine Freberg in the Sahl role--that might have made this bearable. My favorite part of the episode was the trumpet music, especially the mournful bit when Sahl was alone in the cabin. But as I watched, I couldn't help thinking that if this were 1960, I would have quit watching this show each week by now--assuming I made it past "Child's Play." One more thing--how great is it that the John Williams commercial plays when you click on this blog??? Is the actual commercial on You Tube? I searched a couple of years ago with no luck. Congratulations, Jack, you are officially the only one, besides the inmates who run the asylum around here, to have the good sense to appreciate the Polovetzian Dance #2 by Borodin. Some people won't eat the caviar when it's laid out before them. Oh, I appreciate the Borodin alright (I conducted his 2nd Symphony and Polovtsian March last May)--but in limited doses. And that cheezy zoom out from the harp strings with the Beethoven bust in the background really puts me back in a late-night, 70's TV state-of-mind. Plus, I still can't get enough of JW's loving little slap he gives the stereo console before speaking; the guy really knew how to play a scene. Another bottom-of-the-barrel special. Dreadful, annoying, poorly acted by Sahl. Certainly one of the worst episodes of the THRILLER series... my vote for worst is still THE BIG BLACKOUT. "0 Karloffs", unfortunately by second zero rating in the series. After watching the last episode I thought that they finally figured out the ingredients to make a tasty Thriller crime drama. Wrong! I guess that good acting, smart scripts and believable plots left a sour taste in the Thriller studio staff's mouths, so let's go back to throwing a bunch of cheap ingredients in the bowl and stir it up for next week's episode. The only thing that Man in the Middle has going for it, is being able to watch the relatively well known Mort Sahl and Werner Klemperer act against type. I'll agree with everyone here. Mort is plain miscast. He's dreadful, but because it's Mort I'm slightly forgiving of his performance. The premise of the show might have been ok, but none of the characters make any of it believable. True, it might have helped if they were given a script that took more than an hour to compose. This episode really dragged and had my finger reaching for the fast forward button. The only thing I enjoyed was the tough guys. Were all crime drama episodes required by contract to have at least two tough guys. I would've have loved to have seen the try outs for those parts. I can't imagine that they consisted of anything more than beating up some unfortunate rube for a few minutes. 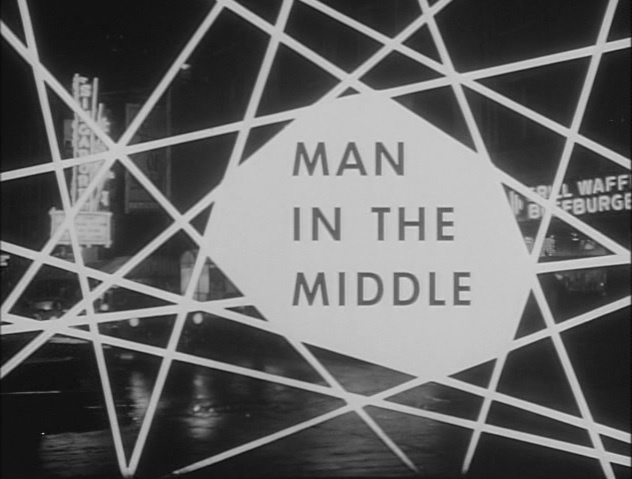 My rating for Man in the Middle is one Karloff. What a waste. To call Mort Sahl's acting inept is an insult to all the inept actors of the world. Nicely turned, Frank, unless we want to say he's taken inept acting to a whole new level. John Scoleri's remark about him being outperformed by a lamp is also on the mark. Actually, Sahl was outperformed by TWO lamps, because there's also the oil lamp at the hideaway. Plus, I'd even go so far as to say Mort was upstaged by his own nostrils...now that's tough! Mort Sahl so desperately wanted to do serious acting in addition to his stand-up comedy, but as this episode proves, he couldn't 'get in that world'. Sue Randall is appropriately ditzy, the ubiquitous Fred Beir does well in the stock role of arrogant rich boyfriend, and of course, we have Werner Klemperer, suitably menacing as Mr. Klink, I mean, Clark. 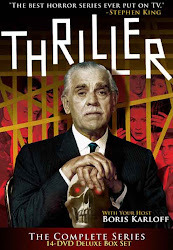 I can't help but think this may have been more suited for the Alfred Hitchcock Hour than Thriller, and this episode may not have even lived up to that series' standards. Col Klink. ME TV is running all the Golden Oldies to include Hogan's Heroes. MAD magazine had a great parody of that show, mazel tov, but I haven't located a parody of Thriller in my vintage collection of 1960s MAD magazines. Mort Drucker's illustrations of the MAD TV parodies are priceless. Me-TV ran a Peter Gunn episode with Shelley Berman as a murderous paranoiac last week that was also pretty bad, although his acting was OK. It didn't even feature Lola Albright! I never saw this one tiil less than a year ago, and I halfway agree about it, but I don't think Mort Sahl was really awful. But there is one "jarring" thing about his performance, and that's that every time he gets aggravated he sounds like Ray Romano on EVERYBODY LOVES RAYMOND getting aggravated. There's that same muffled sound to the voice. There's at least one sort of accidentally funny moment NOT mentioned here (? ), and that's when Mort Sahl's friend has an entire short conversation with him before revealing that's he's been fatally wounded. It reminds me of that scene in THE CHEAP DETECTIVE, where those two assassinated spies sit with the other characters for about a minute before keeling over. One original thing this episode DOES do is that it avoids a pretty big cliché - Fred Behr's fiancée character might act unconcerned as someone here says, but he doesn't act like a real jerk at the end of the story, making Mort Sahl look so much better to her. Usually when there's a "hunk" character and a "nebbish" character in a love triangle story, the story goes out of its way to make the first one look really bad. Here they just did that a little. I kind of get a kick out of the fact that Clark and Hoffman tried collecting the ransom even though they didn't have the victim, just like the nihilists in Big Lebowski. Klemperer was a good villain, surprisingly restrained. And I appreciated Sue Randall playing a relatively courageous damsel in distress. Not a great episode, though. Sahl might have been better if they'd erased all his lines.